The home of the African Bushmen - now officially called the San - is Kalahari Desert and the adjacent areas of Namibia and Botswana. They became well known thanks to the popular movie ”The Gods Must Be Crazy”. The ancestors of today's San have lived throughout southern Africa probably already over 100 thousands years ago. 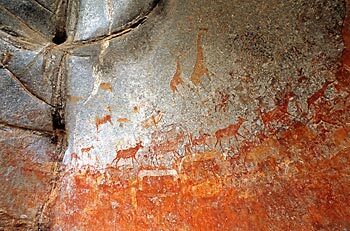 The remarkable rock paintings, which they left behind, are the evidence. Until today the Bushmen remain hunters and gatherers, despite the fact they were pushed by the black and later white farmers away from the fertile lands rich in wildlife, and eventually ended up in central Kalahari. They are famous for their deep knowledge of nature and exceptional hunting and tracking skills which allow them to obtain everything they need from an extremely inhospitable environment. We met the San a bit unexpectedly in central Namibia. 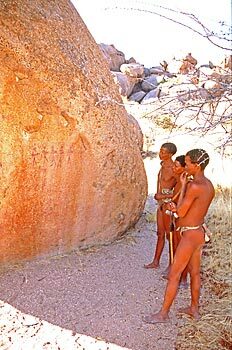 We were in fact looking for some ancient rock paintings, which were left by their ancestors in many places in southern Africa thousands of years ago. On the way we saw a sign advertising ”The San - Living Museum”. At first the name almost discouraged us, but we learnt that it was a project trying to help the San of Namibia through tourism at least partially keep their traditional way of life and preserve their unique knowledge. 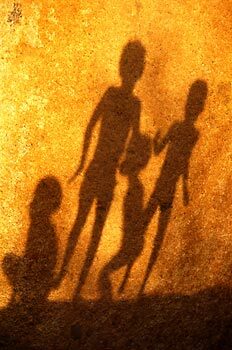 The Bushmen traditionally live in small family clans. The family we visited came from north-eastern Namibia (called Bushmanland) and found their new home on a large farmland. There they are allowed to live like they used to in Kalahari with only one exception - Namibian laws do not allow them to hunt but they get meat from the farmer in exchange for part of the profits from tourism. In all other aspects they try to be self-sufficient. We spent with the family the whole afternoon. First we joined the men on a walk into the bush. They showed us how they look for edible roots, set up a bird trap, or start a fire by rubbing the sticks. One of them (he called himself Tom because we wouldn't be able to pronounce his San name anyway ...) spoke good English and took the role of guide. He was answering our questions modestly and very sincerely. He, for example, told us that the right sticks for starting the fire cannot be found in the area, so they have to ’import’ them from their original homeland in Kalahari. Back in the camp we sat with the whole group and soaked up a peaceful evening atmosphere with the family clan. Great impression made on us their calm and relaxed dignity. They talked in a low voice in their unique soft ’clicking’ language (distinct for the use of ’clicks’ as consonants), laughed often, and both men and women played with the children. My photographing didn't seem to bother them at all but I think they were looking at me with great amusement. Their life was happening right there and then, and to try to capture these unique moments on a piece of film couldn't make any sense to them! Yet I hope that I managed to capture at least some of the magic of this beautiful human existence. We would like to thank to the whole San family we visited for being who they are and for sharing some of their magic with us.